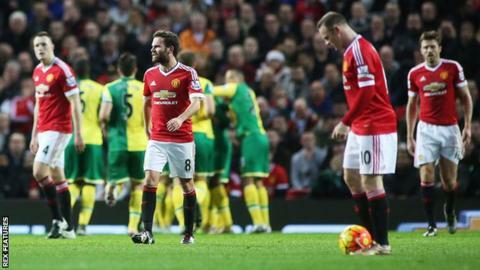 Manchester United manager Louis van Gaal has said he is "worried" about his job after a shock 2-1 loss to Norwich. The result handed United a third defeat in a row in all competitions and are now winless in six games. Cameron Jerome and Alex Tettey netted for the visitors, while Anthony Martial replied for the hosts. Asked if he feared for his position, van Gaal said: "Yes of course I am worried about that because I know that belief in a manager is very important." The Dutchman, 64, could not give a definite answer when asked if he will be given time to turn the situation around at Old Trafford. "Yes I think so but I never know, in this world, you never know. It is not up to me, but we shall see," he added. Van Gaal is out of contract at the end of the 2016-17 season and there has been speculation that Jose Mourinho will become the next United manager after being sacked by Chelsea on Thursday. The Portuguese says he wants an immediate return to management and has been linked with the Old Trafford job, as has Bayern Munich boss Pep Guardiola who is to clarify his own future on Sunday. "That's the football world. I know that, my board knows that, my players know that," van Gaal said when asked if the pressure was building on him. "I don't think a change of management shall bring direct success - but that is what I believe. Maybe that is not so interesting. "I am always evaluating myself because I think that is an aspect of the philosophy I have. But the philosophy is also making an evolution - I am not the same coach I was 25 years ago. "So, you are always evaluating and of course that philosophy is very important for me. Because of that I am - or maybe I have to say now, was - a very successful manager." Defeat meant Manchester United have now gone six games in all competitions without victory for the first time since 1998. United had 70% possession against Norwich, but could only muster two shots on target as they were booed off by their own supporters. The Red Devils face a testing festive period, starting on Boxing Day against Stoke at the Britannia Stadium, before they host Chelsea at Old Trafford two days later. They then face managerless Swansea on 2 January. Van Gaal added: "The main thing is that you have to be professional and do the things that you have to do and work very hard to come out of this bad period. "It was not good enough. You have to win against Norwich. We know that. Now we prepare for the Stoke game with professionalism and spirit, that is the only message I can give [to you]."